Registration and provisioning of users, devices, and things is a repetitive and potentially time-consuming task that has a significant impact on security and user access. 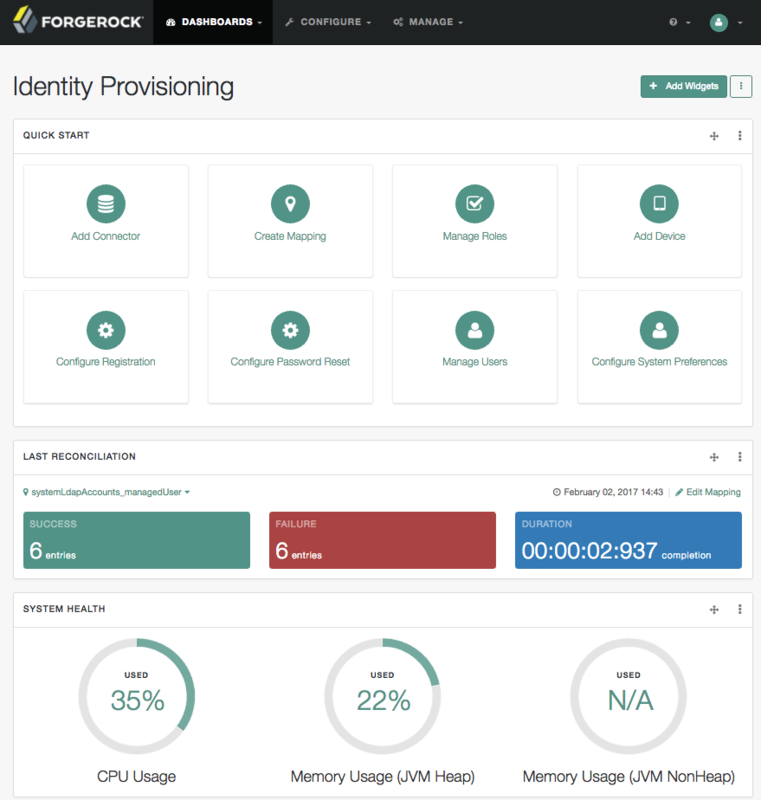 Let ForgeRock help simplify the identity provisioning process of managing roles and entitlements assigned to users, devices, or things, based on your organizational need and structure (such as job function, title, and geography) and assign and remove entitlements and resources consistently and rapidly. Use a responsive framework that can be deployed on-premises, in the cloud, or in hybrid environments. Manage previously disparate data repositories, network applications, and user data stores anywhere in the infrastructure stack. Add the ForgeRock Open Connector Framework and flexible workflow engine to provision and assign relationships to users, devices, and things. Easily customize and manage the registration and provisioning process. Support a “least privilege” security model by decentralizing control with Delegated Administration. Eliminate the need to rip and replace infrastructure components with the ability to access existing resources using native protocols; and without the dependency of complex agents and extra infrastructure. Consistent provisioning to your existing infrastructure components will ensure policy-compliant identity data and a single view of all managed identities. Offers flexibility for identity provisioning at massive scale, with your choice of back-end structure (SQL) and technology (MSSQL, MySQL, Oracle, DB2, PostgreSQL, MariaDB, etc) for your deployment. Features role-based provisioning, high availability “out of the box,” workflow synchronization (with delivery guarantees), user interfaces that you can customize, and password management. Enables flexible, plug-and-play services with a lightweight, pluggable and modular Java architecture, built on the OSGi framework. Purpose-built for big data-scale requirements across enterprise and customer-facing systems. Provides an open object-based model that is not hard-coded –giving you the flexibility to define different schema, objects, attributes, and relations to fit your exact requirements. Allows you to dynamically update services and upgrade connectors without reconfiguration or restarting. Delivers simple access to cloud-based systems and resources to provision changes and aggregate data. The ForgeRock Identity Platform data connectors are a standardized, out of the box way to connect/integrate third party identity repositories such as HR databases, directories, files, and XaaS providers. They are also community driven with a catalogue of contributions available online. System connectivity is modular, extensible, and separate from the core engine. Scriptable to enable connections to bespoke APIs for data collection and bi-directional syncing, you gain exceptional flexibility to integrate, collect and synchronize data from many different sources, both modern and legacy. These services and connectors can be dynamically updated and upgraded without reconfiguration or restarting.